Kathy shared that she really didn’t have experience in managing an estate. Her sister had children that lived out of state, and she had to explain the process to them via email and phone calls. It was a challenge to help the beneficiaries understand the timeline of settling the estate because it was many months to just get to the point of readying the decedent’s home for sale. As one of the largest assets in the San Diego trust, it was a process and an expense to prepare the home for the highest price and best terms sale. Once the San Diego trust home was sold, the process of closing the estate also took months. Kathy believes that her biggest responsibility was teaming with the best professionals, including my team, keeping all the children informed of her progress, and remaining calm. 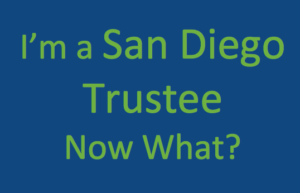 So, this is an overview of some details when becoming a San Diego trustee entails. Each San Diego estate is unique, and having a trusted team to lead, guide and protect you as the San Diego trustee, will help you to “press the easy button”.